DENVER, Colorado (CNN) -- Sen. Hillary Rodham Clinton likely will release her delegates to Sen. Barack Obama, a Democratic official said Sunday, the eve of the Democratic National Convention. Sen. Hillary Clinton will meet with her delegates on Wednesday before that night's roll call, a spokesman says. Also Sunday, the Democratic Party decided delegates from Michigan and Florida -- states that had been penalized for moving their 2008 presidential primaries to January -- will get full voting rights at the event. The moves answer some questions that lingered ahead of the convention, which starts Monday in Denver. Clinton, who suspended her presidential campaign in June after Obama secured enough delegates to win the party's nomination, will meet with her delegates at a reception in Denver on Wednesday afternoon -- before that evening's delegate vote on the nominee, said a Democratic official who asked not to be named. "[The reception is] an opportunity for Sen. Clinton to see her delegates -- many for the first time since the primaries ended -- thank them for their hard work and support and most importantly, to encourage them to support and work for Sen. Obama as strongly as she has, in order to elect him in November," Clinton spokesman Philippe Reines said. Because Clinton suspended her campaign instead of dropping out, she kept the pledged delegates she earned in the primaries and caucuses. 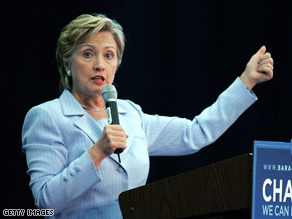 Clinton already has urged the 18 million people who voted for her in the primaries to get behind Obama. Meanwhile, the Democratic National Committee unanimously voted to end sanctions against Florida and Michigan. The party initially stripped Florida and Michigan of their delegates for holding presidential primaries earlier than the party had wanted. However, in late May, the DNC's rules and bylaws committee voted to reinstate the delegates but give them each a half-vote. Sunday's decision gives the delegates a full vote at the convention. Ending the sanctions had been a goal of Clinton, who won Florida and Michigan in her unsuccessful bid for the Democratic presidential nomination. Obama endorsed lifting the sanctions after Clinton's withdrawal from the race. Between Monday's convention opening and Thursday night's acceptance speech by Obama at Denver's Invesco Field, delegates are expected to ratify his nomination and that of his vice presidential pick, Sen. Joseph Biden, another former primary rival. Obama faces Republican Sen. John McCain in November in the contest for the presidency. McCain's campaign has poked at the old Obama-Clinton splits with a campaign ad claiming Clinton was passed over for the No. 2 spot because she was too honest about Obama's perceived weaknesses. "The truth hurt, and Obama didn't like it," McCain's ad says. But Rep. Jesse Jackson Jr. of Illinois, an Obama supporter, told CBS' "Face the Nation" on Sunday: "This campaign is not about Barack Obama and Hillary Clinton." "His campaign is about George Bush and four more years of George Bush under John McCain," Jackson said. "That message is going to echo clearly from this platform." A new CNN/Opinion Research Corp. poll released Sunday night showed that Obama's lead over McCain has evaporated. Forty-seven percent of those questioned are backing Obama, with an equal amount supporting McCain. Taken after Biden's selection, the poll showed that the number of Clinton Democrats who said they would vote for McCain increased 11 points since June, enough to account for most of the support McCain gained. Clinton fared better than Obama among working-class voters in many states during the primaries. Obama on Sunday suggested the convention would help give those voters "a sense of who I am." Obama said he hopes voters will conclude that he is "sort of like us. He [Obama] comes from a middle-class background. He went to school on scholarships, he had to pay off student loans. He and his wife had to worry about child care." "You'll find out: 'He's pretty much like us,'" Obama told supporters about himself, while campaigning in Wisconsin on his way to Denver. Obama hammered at McCain on the economy and on McCain's perceived strong suit, national security. Obama told supporters at a barbecue in Eau Claire, Wisconsin, "The Republican track record on national security has not been particularly good." "My job in this campaign is to explain that talking tough and acting dumb is not a way to keep you safe and secure," he said. "We need somebody who talks tough, who's going to act smart and be tough. That's how we're going to look after the safety of the American people." Minnesota Gov. Tim Pawlenty, viewed as a potential McCain running mate, said Obama's decision to pick Biden -- the chairman of the Senate Foreign Relations Committee -- was an acknowledgment that Obama lacked to national security chops to be president. "I don't think he's ready to be president. And when you're commander-in-chief, you shouldn't be having to select a mentor to help you with that role," Pawlenty told CNN's "Late Edition with Wolf Blitzer." CNN's Jessica Yellin and Rebecca Sinderbrand contributed to this report.